Pony Express, San Francisco, Sep 1, remarkable bold strike of blue Running Pony oval datestamp ties 1857, 10¢ green, type V (35) on piece also with sharp complete strike of "The Central Overland California & Pikes Peak Express Company, St. Joseph, Mo., Sep 13" oval handstamp, Very Fine and quite attractive. A CHOICE PIECE SHOWING BOTH THE SAN FRANCISCO RUNNING PONY HANDSTAMP AND THE CENTRAL OVERLAND CALIFORNIA & PIKES PEAK EXPRESS COMPANY OVAL. 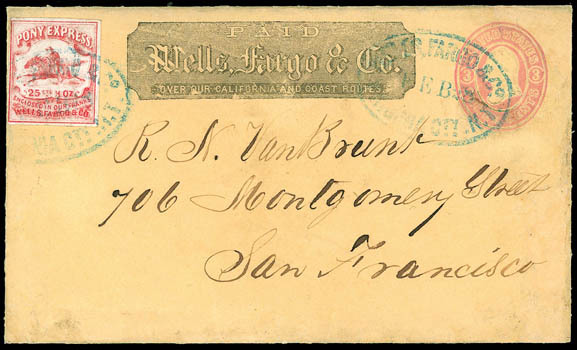 (Pony Express) Wells Fargo & Co., 1861, $1 red, four margins, tied by blue "Pony Express, San Francisco, Aug 31" running pony oval handstamp on 10¢ Star Die entire with red Wells Fargo Co. company frank addressed to Hon. 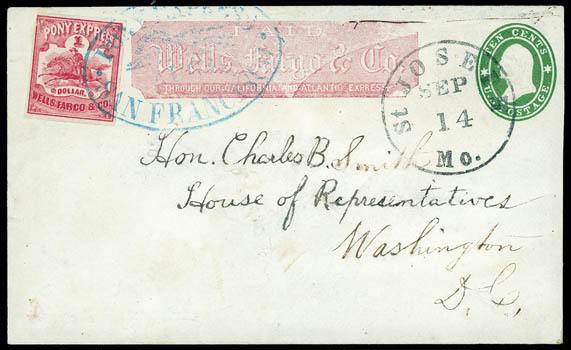 Charles B. Smith, House of Representatives, Washington D.C., postmarked at Pony Terminus by sharp "St. Joseph, Mo. Sep 17" cds; cover abrasion and slight erosion with address partially rewritten, Fine, a scarce Pony Express use, ex-Meroni. Scott No. 143L3 Estimate $7,500 - 10,000. (Pony Express) Wells Fargo & Co., 1862-64, 25¢ red, clear to mostly large margins, tied by blue oval "Wells Fargo & Co., Virginia City N.T., Feb 28" handstamp (Leutzinger type 12-3 with "Cty"), struck twice with one canceling on 1861 3¢ pink entire to street address in San Francisco, black company frank at top, with original mining business enclosure datelined "Feby 19th 1865", some minor edge improvements not mentioned on certificate, Very Fine; with 2014 P.F. certificate. Scott No. 143L9+U35 Estimate $6,000 - 8,000. A RARE AND CHOICE VIRGINIA CITY PONY EXPRESS USAGE WITH MINING BUSINESS ENCLOSURE FROM THE "LAST GASP" OF THE VIRGINIA PONY SERVICE. The Virginia Pony was terminated in July of 1864 because the roads had been improved to the extent that stagecoaches were making just as good time as the pony riders. However, the following winter, after storms fowled the roads, the premium service was revived for another two months. The last gasp of the Virginia Pony was from December 29, 1864, to March 2, 1865. (Pony Express) Wells Fargo & Co., 1862, 10¢ red, Virginia City Pony Express stamp printed on 1861 3¢ Nesbitt entire as part of a paste up, with "Wells Fargo & Co./ San Francisco" blue double cds (Leutzinger 11-4), minor backflap and edge restoration, otherwise Very Fine. Scott No. 143LU1; $3,000 Estimate $2,500 - 3,500. A GREAT VIRGINIA CITY PONY EXPRESS RARITY - ONE OF FIVE EXAMPLES RECORDED OF THE WELLS FARGO & CO. 10¢ PONY EXPRESS INDICIA. There are 5 used copies known, one of which has some additional stamps missing. These are far rarer than any of the stamps issued for the same purpose. 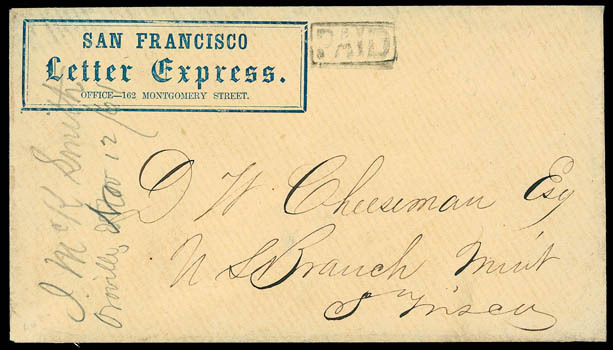 San Francisco Letter Express., Office - 162 Montgomery Steet, blue double rectangle boxed frank at upper left of locally addressed cover to D.W. Cheeseman at the U.S. Branch Mint, with boxed "Paid" handstamp alongside, pencil docketing "J. McK Smith, Oroville, Nov 12/61" at left, Very Fine, ex-Lichtenstein. EXTREMELY RARE WITH TWO KNOWN EXAMPLES OF THIS SAN FRANCISCO LETTER EXPRESS PRINTED BLUE BOX FRANK. J.W. 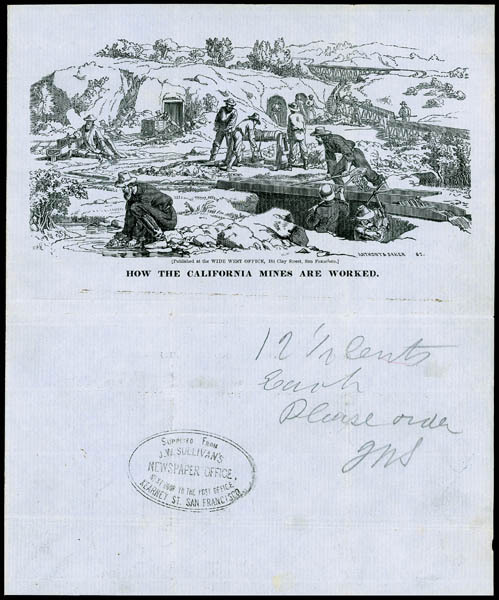 Sullivan's Newspaper Office (Supplied From), Next Door to the Post Office, Kearney St., San Francisco., choice strike of oval handstamp on illustrated lettersheet How the California Mines Are Worked (Baird 104) with finely executed 3¾ x 7¼" wood engraving, shows placer miners using the pan, rocker, long tom, and sluice, Anthony & Baker engravers and The San Francisco Wide West newspaper publisher, with pencil notation from proprietor J.W. Sullivan "12½ Cents Each, Please order. J.W.S. "; enclosure folds, Very Fine. AN ATTRACTIVE AND RARE ORDER SAMPLE OF A CALIFORNIA ILLUSTRATED LETTERSHEET SUPPLIED BY J.W. SULLIVAN'S NEWSPAPER OFFICE. 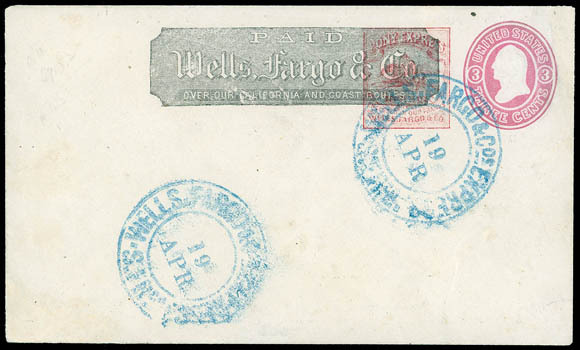 Wells Fargo & Co., Newspaper Stamp, 1883-88, blue, natural s.e. 's at top and right, on wrapper to Coronado, Cal., tied by blue "Wells, Fargo & Co's, Express, San Diego, Cal." oval handstamp, Very Fine; with 2014 P.F. certificate. Scott No. 143LP9 Estimate $2,000 - 3,000. A VERY RARE USAGE OF THIS WELLS FARGO & CO. NEWSPAPER ISSUE ON WRAPPER - WITH ONLY A FEW EXAMPLES KNOWN.